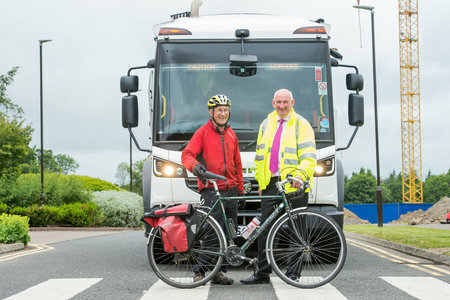 City of Edinburgh Council is demonstrating its commitment to cyclists and vulnerable road users by installing market leading safety equipment from Innovative Safety Systems Ltd (ISS) to its waste and recycling collection fleet, comprising over 40 vehicles. Cyclear® helps to protect vulnerable road users by detecting passing cyclists and audibly alerting the driver. The system alerts drivers to the presence of cyclists when the left indicator is activated. An audible speaker also sounds to let cyclists and vulnerable road users know when the vehicle is turning left as a second tier warning. This is coupled with an intelligent sensor arrangement that detects cyclists and alerts drivers if they are being undertaken and the indicator is not in operation. The RX3 hard disk recording system has a proven track record in reliability and can accommodate up to 16 cameras and 2 audio inputs. Key features include speed, XYZ acceleration and GPS positioning. For further information about the RX3 DVR System, LANlink, Cyclear® or other ISS products and services tel:02476 442699 or visit www.iss-international.co.uk.